Ceramicist Laurel Begley creates a fresh take on a romantic tradition. Some may say it’s “I do” that solidifies true love. We say it’s when your initials are carved into bark. Ceramicist Laurel Begley creates a fresh take on a romantic tradition with this keepsake vase. Laurel crafts an intricate faux bois texture inspired by the winding furrows in a tree's bark, shaping each “trunk” out of thick stoneware and adding a personalized heart with the couple’s initials. A thoughtful gift for a wedding, bridal shower, or anniversary party, it’s a piece that will remind them true love grows stronger with time. Handmade in Santa Rosa, California. Inspired by vintage knickknacks she inherited from her Nana and simple celebrations like family dinners, Laurel Begley hopes the vases she makes in her Sonoma County studio become part of a home’s narrative and an heirloom in its own right. 7.5" H x 3.5" dia. We have received numerous compliments on our unique vase. It is the perfect addition to our decor. I love this vase, I am sure it will be used often! My nephew and his wife to be will decide how to use their gift. 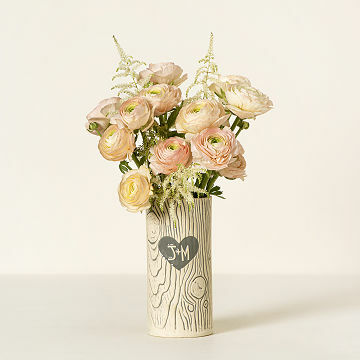 Love, love, love this personalized vase! We received it as an engagement gift last year and we think of the gift-givers every time we use it. When not in use as a flower vase, it still looks great on a shelf. We gave this to a sister and brother-in-law for their 50th wedding anniversary. They wanted to keep any celebratory things modest.This small and expressive gift was perfect and recieved with joy! My wife really loved this vase and plans to use it throughout the year for her flowers. The only complaint that I had is that the vase is much smaller than I expected. I took it to the florist and they were more than happy to arrange in my vase. I honestly believe i got better flowers than others because they saw my request was special. They delivered in the heirloom vase to her work and it blew them all away. My friend was thrilled with the gift when she got it in the mail. She loved the look and how it was personalized. Arrived quickly and packed with care. I didn't use as this was purchased as gift. Great personalized vase, wonderful wedding gift! This made a perfect wedding gift! Extremely pleased with the product.